It may have been an unfortunate coincidence that Microsoft and Google had their annual developer conferences almost at the same time, but each had plenty of announcements to make and some of them may have been overlooked. One such announcement comes from Microsoft, as the Redmond-based company confirmed that the Nearby Share feature, which made its debut in the April 2018 Update for Windows 10, will be available on Android and iOS as well. Nearby Share allows users to transfer files from one Windows 10 PC to another, as long they are connected to the same Wi-Fi or they're connected to each other via Bluetooth. In fact, Microsoft demoed Nearby Share at Build 2018 conference and said that Android users can already use this feature to some degree (see the diagram below), but the feature will be improved with additional uses in the not so distant future. Unfortunately, Microsoft did not say when Nearby Share support will be fully implemented for both mobile platforms, Android and iOS, but it looks like the company is starting with Android. 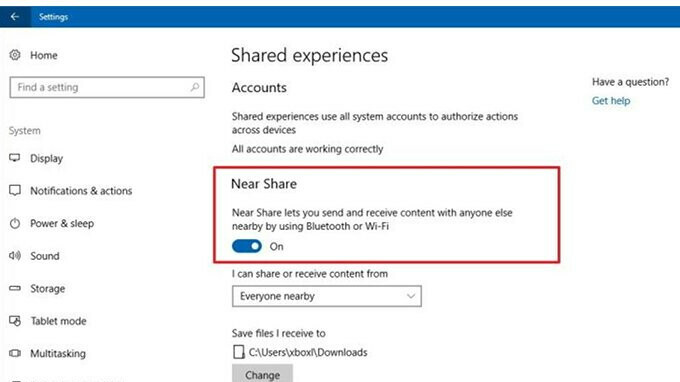 We'll let you know if/when we learn more about Microsoft's plans to expand Nearby Share feature to mobile devices.